Getting a toddler to do anything they don’t want to do is near impossible. Tantrums are an inevitable part of life, usually at the worst possible times and in full view of others. But can you imagine it happening on live television? US television producer Torrie Williams Duckson found out when she dared to try and buckle her son Noah in a car seat during a live news report. Whether it be getting them to share toys, sit in a high chair or eat their vegetables, sometimes you have to pick your toddler battles. But there is no compromise when it come to the car seat and most of us have experienced the brute strength and contortionist skills our little ones can muster to avoid being strapped in. When Good Day Philadelphia needed a tiny tot to demonstrate the correct way for children to be strapped in, the show’s producer Torrie’s adorable little boy seemed like the perfect choice. But, as toddlers do from time-to-time, Noah decided he was not having any of it. Unphased by the camera and the desperate look of blushed panic on his mum’s face, Noah twisted and flipped and kicked his little legs until finally his mum had enough on-air humiliation and let him climb into the driver’s seat, where he happily smiled and waved at the camera. While copping some flack from viewers over her son’s behaviour, Torrie took it all in her stride as she reflected on the hilarious and totally relatable sequence of events. “Being a producer, I knew once the expert started speaking I would put the baby in the seat for the demonstration,” Torrie says. “That’s when all hell broke loose! Once he pulled the rubber off the car the second time, I just started laughing because it was all I could do to keep from crying in embarrassment. Realising she was fighting a losing battle in front of a mass audience, Torrie did what we all would have done and gave up. 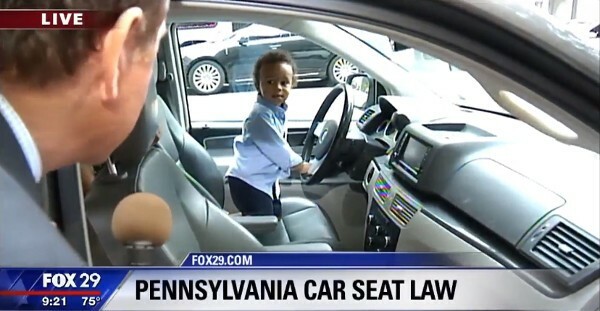 It may not have helped explain new car seat laws all that well, but it made for very entertaining viewing, just like the clip of runaway flower girl Chloe, who made a memorable dash during her aunt’s nuptials.